Tell us a little about yourself and how you first became interested in Chameleons. I'm 51 years old and grew up in Baltimore County, MD, back in the day when we went outside as kids. Father of 4 and Grandfather of 3, I had a hognose snake scare the be-Jesus out of me at Loch Raven Reservoir when I was 12 years old. Been hooked on reptiles ever since. Besides my family, my life has been shaped by 7 years with the 82nd Airborne at Ft. Bragg, NC, and almost 20 years in the service industry. While I had a couple of friends who had dabbled in Jackson's chameleons through the years, seeing my first in 1969, it was in 1998, while supervising for a major pet store chain, that a customer literally walked in the door of one of the stores with a half-dead Nosy Be panther chameleon, saw my name-tag, and handed it to me saying "here, its yours". Then he walked out. We sold panthers, but I hadn't kept one personally up to that point. I took the animal home, got it in the sun, and it rebounded quickly. I was lucky. How did this initial interest become The Chameleon Company LLC? I was hooked with that first animal, and shifted my snake hobby more to panther chameleons. With the shutdown of the unlimited export of panther chameleons from Madagascar after the '98 season, and the introduction of quotas in 1999, the pet stores couldn't get panthers anymore. 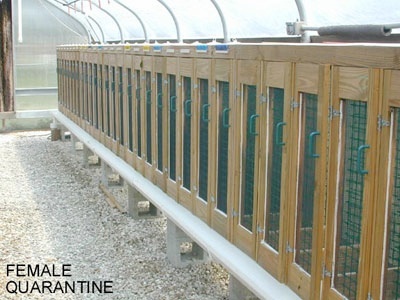 Late in 2000, the opportunities converged to establish a breeding facility here in the U.S., with access to a supply of imported animals, a greenhouse, and some capital. The light-bulb of capitalism lit anew. My wife told me I was crazy, so I quit my day job anyway and founded Bebe Blu Chameleons north of Baltimore, MD. There were business problems there, so in 2002 I left that enterprise, with more capital, and started from scratch again, here in central Florida. Picked a more conventional business name as well. The greenhouse starts to warm as soon as the sun hits it .. about 7:15 AM right now. With a cup of hot coffee, I go down and turn on the overhead sprinklers, done in two parts, with the juvenile rows getting wet first. I'll walk the adult rows and look for any early digging activity by gravid females and mark those cages accordingly. Then they are watered as well. 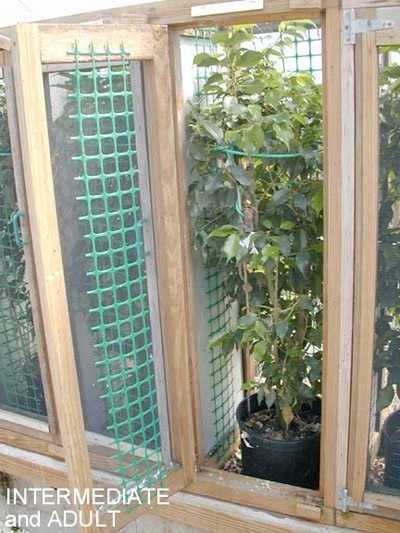 Its about a 15 minute hard rain for all, but with the way the cages are built and foliage, things stay wet for about 3 hours afterward. Once watering is done, I pull that days crickets for feed. 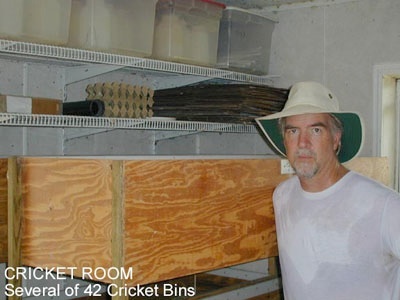 We have about 45 larger cricket breeding bins, each about 6' long. Typically about 10K crickets of five different sizes are pulled and segregated into smaller plastic bins. There they are given our own premium gut load, a concoction that we make in quantities of 100 lbs at a time, and then freeze for later use. We call it "The Last Supper". 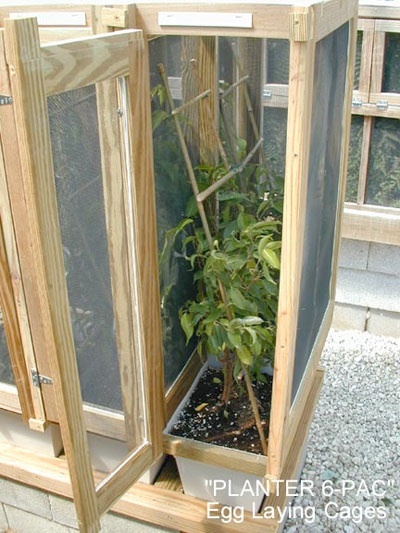 The crickets feast for two hours, then go into the greenhouse to become the feast. In the meantime, there's always daily work to do maintaining the rest of the cricket colony. We still check for laying female chameleons several times daily, as well as hatchlings in our incubation closets. 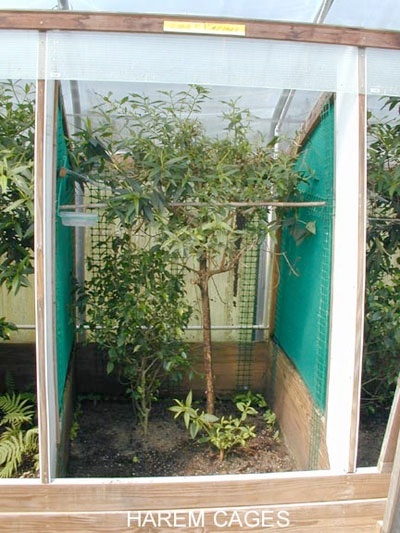 There's cage-building to do, or cage maintenance, plant trimming, movement of animals to breed, or picture-taking for marketing, etc, to be done. We ship three days a week, and that takes time as well. There's always the phone calls and emails to respond to. There is never an "I have nothing to do" moment, just a daily "That's it. I'm done." Your facility is something that everyone is always interested in. Can you tell us a bit about your setup? 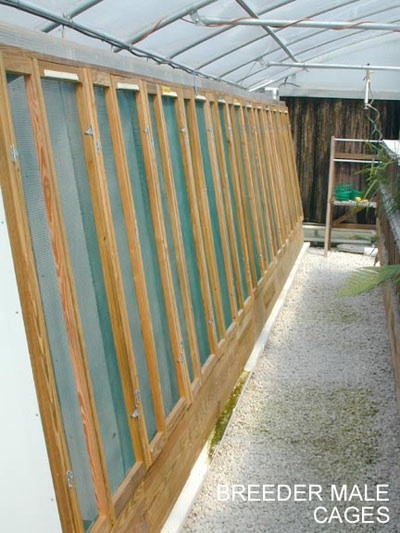 We have 3600 sq ft of greenhouse for the chameleons, several other buildings for insects, and a shop for cage building, etc. 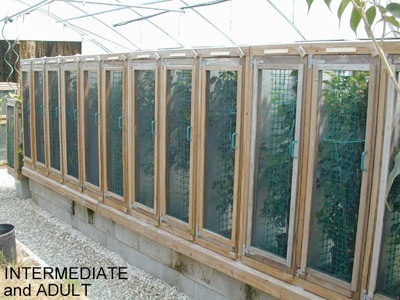 At any give time we have about 800 chameleon cages available, although we are always replacing older styles with newer ones once we identify ways to better solve husbandry needs by improved cage design. Its usually a hot and humid place to work. 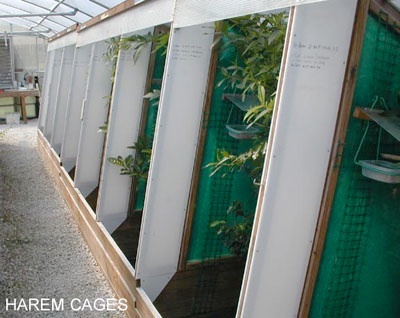 Any cage environment, whether it be indoors in Minnesota, or a greenhouse in Florida, presents its own problems in trying to create the best possible environment for the animal. The hope is always to solve more problems than you create, but no set-up is automatic. A greenhouse affords us some advantages. We have over 250 nozzles that literally rain on the animals, and don't have to worry about drainage. Its never a problem getting things hot. Most of the expense is in keeping it from getting too hot. 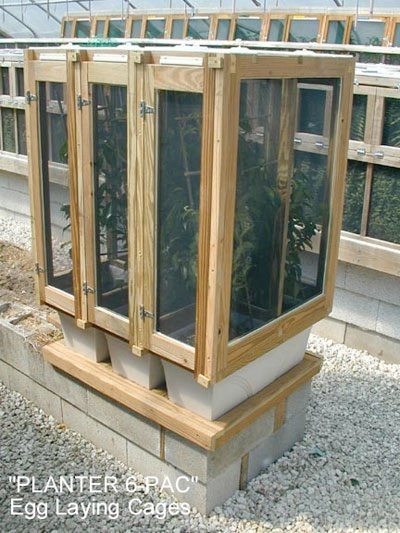 We built the greenhouse, and every cage in it. 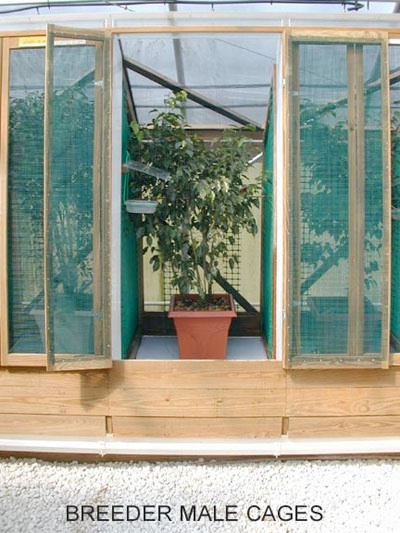 The first question we ask ourselves in every consideration of design husbandry and how we use the greenhouse is "what would Mother Nature do?". Then, "can we do that"? Approximately how many chameleons do you house at any time? A few hundred to a thousand. How many offspring do you produce on average per year? Our goal with the one greenhouse is about 6000 per year. We aren't there yet. How do you manage feeding and nutrition for a collection that size? We are 95% crickets, most of which we raise ourselves, and the rest super worms. We have 45 bins for raising crickets, each about 5-6" long. We go through about 10,000 crickets daily, segregated into 5 different sizes. 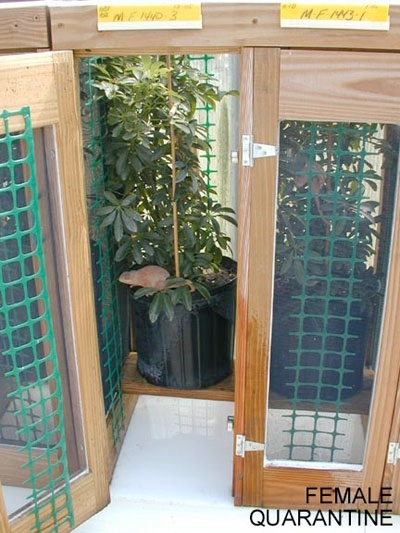 Our chameleon cage design, with lots of acrylic and rubber drain stoppers covering quick-feed holes in each one, allows one person to feed all animals in about 30 minutes. In working with these species, F. pardalis in specific, have you made any observations in nutrition or husbandry that you feel are important for keepers to know? 1.Always over-water. Like a rainstorm, not a mist. 2.Better to gut-load working with one insect than to feed a variety of non-gut-loaded bugs. 3.Always supplement a calcium with D-3, regardless of light source. Whether it be vitamins or calcium, supplement your breeding-sized females 2-3 times what you do your males, to include calcium every other day, and vitamins half that (every four days). 4.Get real "pre-formed" vitamin A, such as retinal palmitate, into the diet. Do not put much credence in vitamin A precursors, such as beta-carotene. About 100 iu's per adult animal per week, especially the females. 5.Oh yeah, for all intents and purposes, your females are almost a whole different species . same with humans I guess. Their needs require far more attention. 6.Nothing beats the real sun. Nothing mimics it well enough to be considered anything but a distant second either. 7.A breeze is good. Still air is not. 8.Bugs kept in less than ideal conditions can easily become vectors for the transport of harmful quantities of potentially lethal bacteria to your chameleons. You cannot eliminate the bacteria, but you can control their quantity. Chameleons do not live in sterile environments, but they do live a wild existence where the thresholds of harmful bacteria present are low and tolerable. Let that get a bit out of hand, and they will be overwhelmed. Good bug husbandry and cleanliness is just as important as the time spent on your chameleons. 9.Read my husbandry pages, as well as those of other known experienced breeders. If you want to post in chat rooms and forums, OK. But go elsewhere for opinions in addition to those places. If you could impart one piece of advice to every chameleon keeper what would it be? LOL !! This question should be disqualified . but the best "one piece" is to not think that anything is automatic with success in chameleons. The only "automatic" is their certain demise if you do not err on the side of being pro-active. Successful chameleon husbandry is not about fixing problems, but rather avoiding them. What, if anything, would you caution other keepers against? This dove-tails with the above, but it would again be assuming that these animals only require a level of effort similar to what we are used to with other common reptile pets. The internet is a huge resource here, but do not assume that the existence of a website gives it credibility, for there are a lot of pretenders out there who thought that having a website made them wise and worthy of being considered experienced. Look to the keeper/breeders with the experience, who have a track record. Read their husbandry pages. Any parting thoughts you'd like to leave us with? Yup ! Two things. As a close friend with decades of chameleon experience loves to tell me "The true experience of anyone who claims to a chameleon expert can be measured in how many they have killed . the higher the number, the more expert they are". Its pretty damn true, although the best "experts" try to learn quickly, lest we kill all of our chameleons ! Secondly, God bless the folks out there who have enough of a passion for these animals to keep the dissemination of husbandry information going. I have a profit incentive to do it. But all the folks who keep the E-Zine going are to be commended beyond us capitalists. And before you, Ardi Abate was tireless with the Chameleon Information Network. There's info that she published 7-10 years ago that is still some of the best out there. Jim Flaherty has been breeding reptiles for over 40 years, but only as his sole means of income since 2001. He is the primary owner and Managing Member of The Chameleon Company LLC , located in central Florida, working primarily with F. pardalis. Father of 4, and Grandfather of almost 3 (3rd Grandson due in Oct '06), he enjoys not being hit by hurricanes when he can. He can be reached at chamco@tampabay.rr.com.